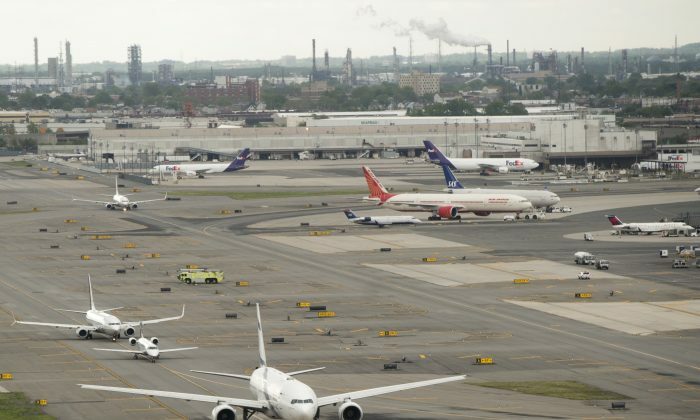 Health officials have issued a public alert to warn passengers who traveled to Newark Liberty International Airport that they may have been exposed to a highly contagious disease. The Department of Health in New Jersey said in a statement on Jan. 12 that an international traveler with a confirmed case of measles had arrived at Terminal C at the Newark airport on Jan. 2 and departed for Indianapolis from a domestic terminal. The Indiana University student, who was traveling alone, was infectious on that day and may have traveled to other areas of the airport. Travelers who were at the airport between 6:30 a.m. and 5:30 p.m may have been exposed to measles and if infected could develop symptoms as late as Jan. 23, according to the statement. Some symptoms of measles include rash, high fever, cough, runny nose, and red, watery eyes. It can cause serious complications such as pneumonia and encephalitis (swelling of the brain), according to the statement. For pregnant women, it can lead to miscarriage, premature birth, or a low-birth-weight baby. Measles can be spread through the air when someone coughs or sneezes. People can also get sick when they come in contact with mucus or saliva from an infected person, the statement said. Health officials urge that anyone who develops measle symptoms should call a health care provider before going to a medical office or emergency department to make special arrangements for evaluation and protect other patients and medical staff from possible infection. New Jersey health departments are working to notify residents who could have potentially been exposed to the disease at the airport. According to the U.S. Centers for Disease Control and Prevention, there were around 120 cases of measles in 2017.